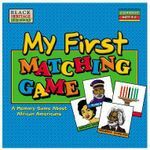 This beautifully illustrated matching game takes an innovative approach to teaching children the richness of the African American experience. Categories include: history, science, inventors, athletes, entertainers and culture. Contents: gameboard, 48 picture cards and a history booklet on each hero or cultural aspect featured.